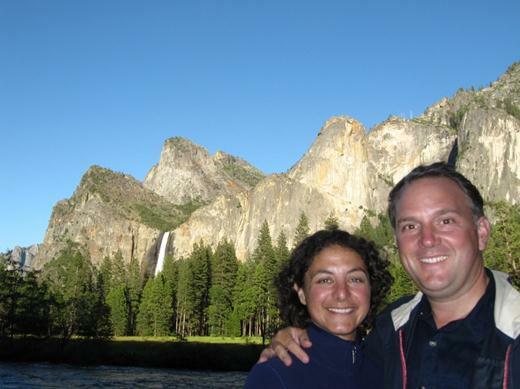 To cross the Sierra Nevada Mountain range we drove highway 4 from Lake Tahoe to reach Yosemite. 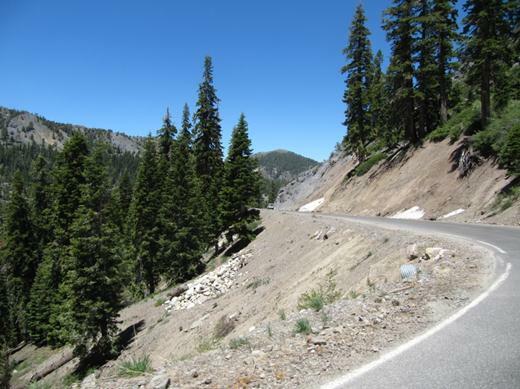 The road goes through Ebbett’s Pass – a narrow two lane highway with some pretty steep drop offs. Marianna practiced using gears to slow Wendy and Chuck on the 24% grade down! Gas prices shot through the roof as we neared Yosemite. We typically pay between $3.50 and $3.80 per gallon. Near the park we started seeing 4.39 then 4.45 then 4.99! Gas prices in the park are controlled so it was 4.62 per gallon to fill up in the park boundaries!?! Since this is peak season for the park, finding a place to camp was also a challenge. Yosemite was jam-packed. 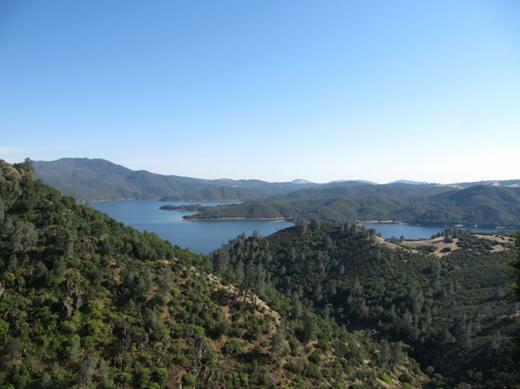 Just outside the park is the Stanislaus National Forest where free roadside camping is permitted. We arrived late in the day so we found a roadside spot and hunkered down for the night. The next day we woke up early and made our way to Diamond-O Campground (an organized campground within Stanislaus National Forest). 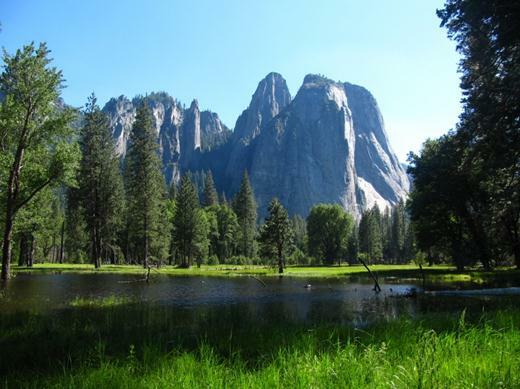 It is only 15 minutes from the park entrance gate and 60 minutes from Yosemite Valley. We found a site for $21 per night – no electricity, no showers and no dumping station, but there was a central water spigot and vault toilets. 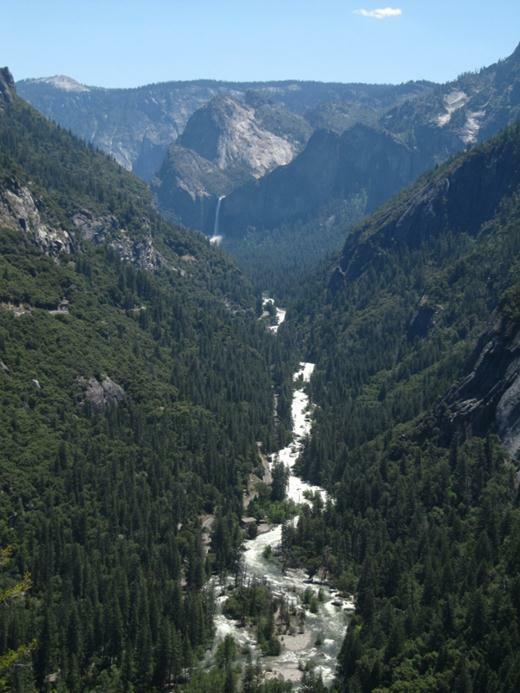 Between gas prices and campsites we really wondered whether coming to Yosemite was the right decision. We headed into the park to search out its legendary beauty. 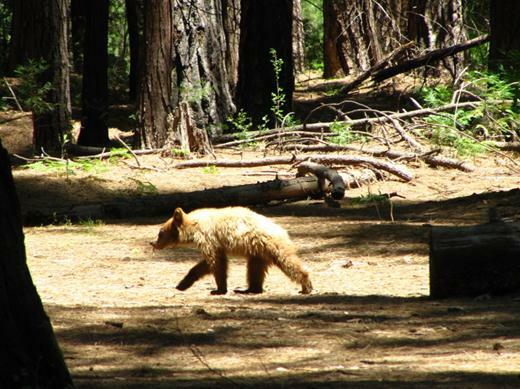 At Yosemite’s “Big Oak Flat” information center we picked up some tips about what to see. 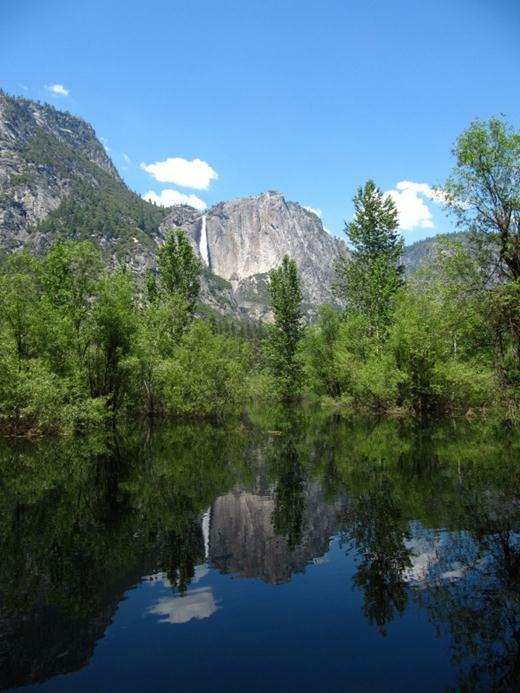 Our first destination was Yosemite Valley. The road down into the valley has a number of pull over spots with amazing views of the valley floor. 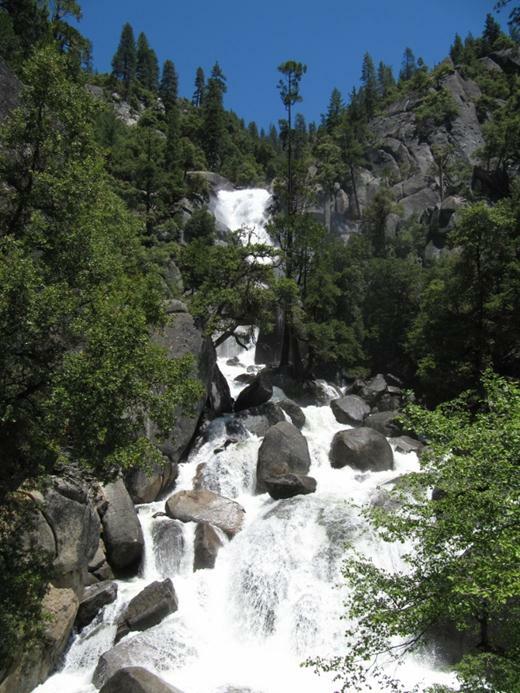 The picture above shows Bridal Veil Fall in the distance and the swollen Merced River. 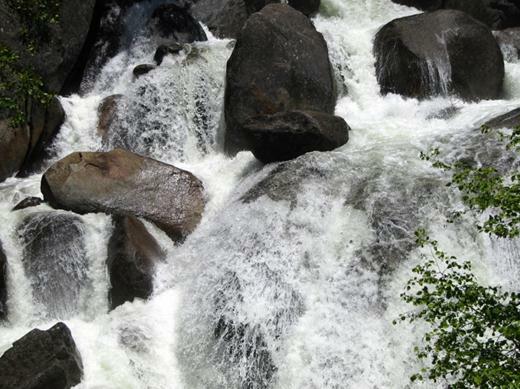 Our first up close view of a Yosemite waterfall – courtesy of Cascade Creek – along the road to the valley. Here it is up close. Do those rocks look like a seat to you? 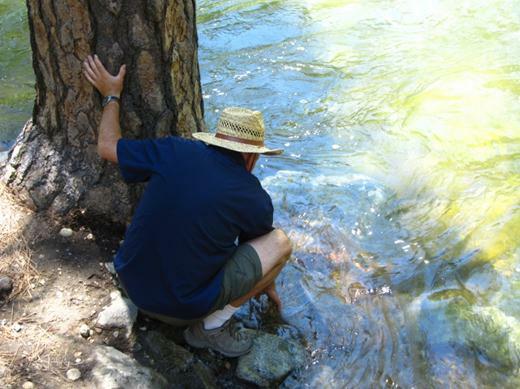 We also saw the Merced River up close and personal at the valley floor. It is definitely at a high point during the spring run off as all the winter snow melts. Spring is late this year so that means we lucked out seeing all this water in late June. 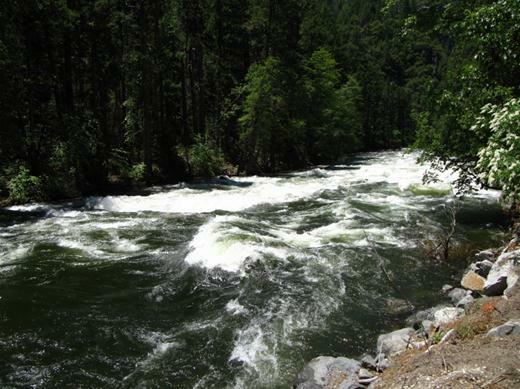 Not surprisingly run off in the Merced River floods the valley on occasion. But we were surprised to learn that it tends to happens in December or January. 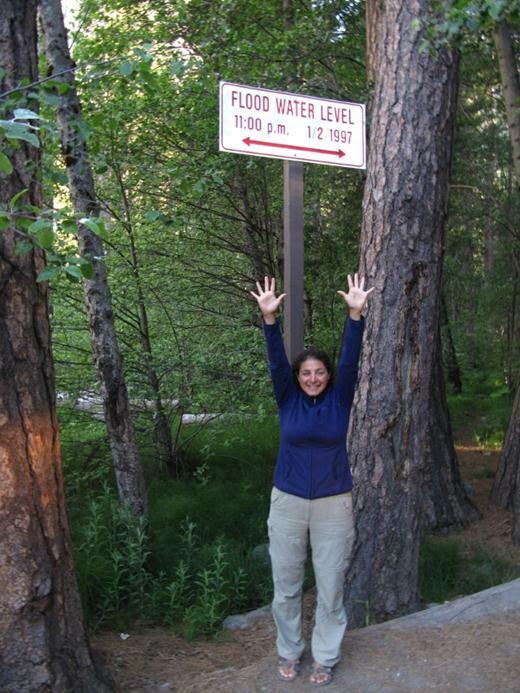 Marianna tries to reach the January 1997 flood levels. Jason checks out the temperature…yup, it’s cold. From a distance Bridal Veil Fall looks small. So we hiked up to get a closer look. At 617 feet tall (188 metres) it’s far from small. Also very misty – we were soaked in seconds! 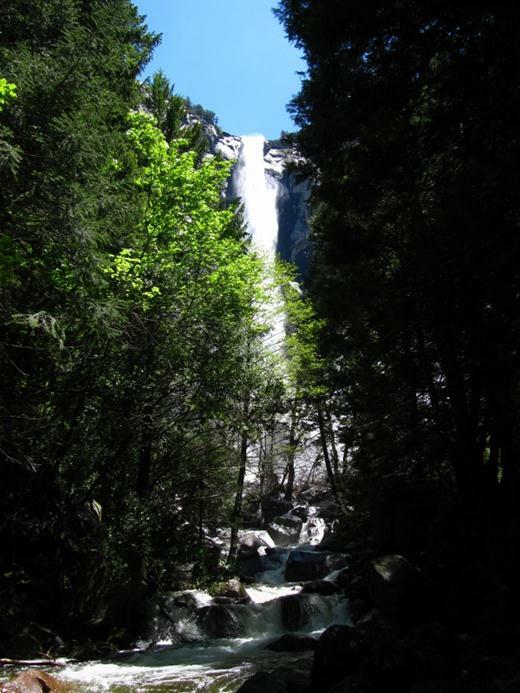 This is one of the few water falls in the park that’s active all year. Most others dry up in the fall once the winter run off is finished. 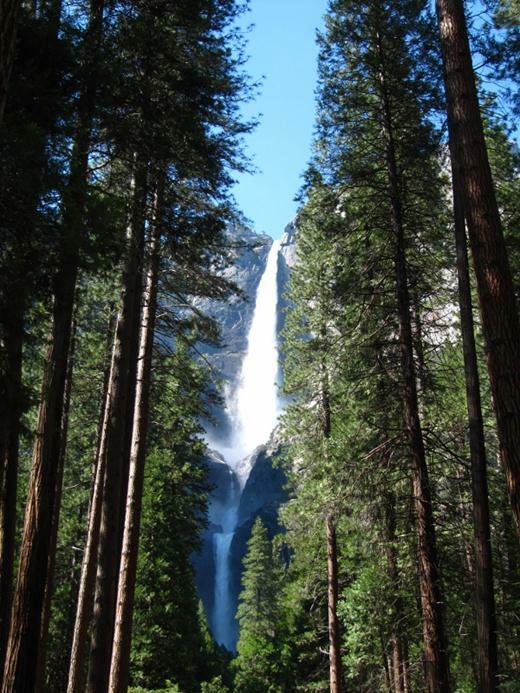 Bridal Veil Falls has nothing on Yosemite Falls – the highest waterfall in North America measuring 2,425 feet (739 m). It has three sections – upper, middle and lower. 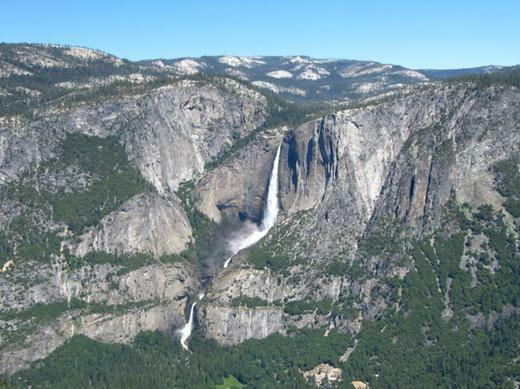 Here it is from another angle (taken from the valley floor) – showing Upper Yosemite Falls and Lower Yosemite Falls. 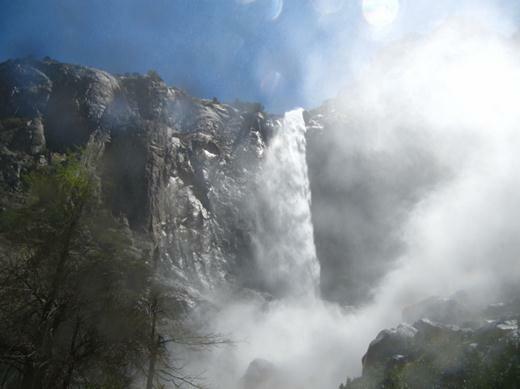 We took this picture of Yosemite Falls from Glacier Point (3000ft above the valley floor) – it is the one viewpoint that shows the water falls as having some depth as opposed to three straight drops. 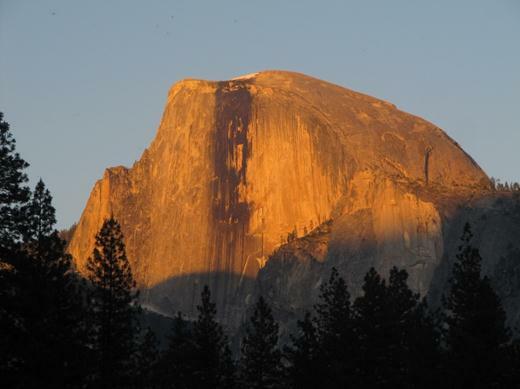 Half Dome – a granite formation more than 4,737 ft (1, 444 m) above the valley floor – is another amazing site to see. The view at sunset is spectacular. 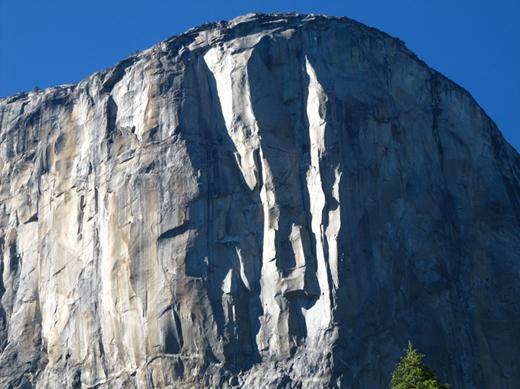 El Capitan is another amazing site to see. The park’s beauty and amazing features kept us in awe every hour were there. 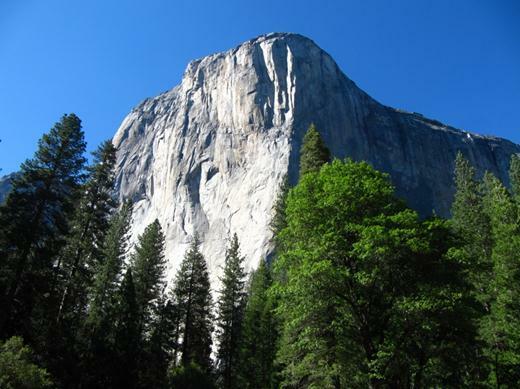 El Capitan is a vertical granite formation that rises 3,000 ft (910 m) from the valley floor. To give you a sense of how big El Capitan is, check out the picture above. 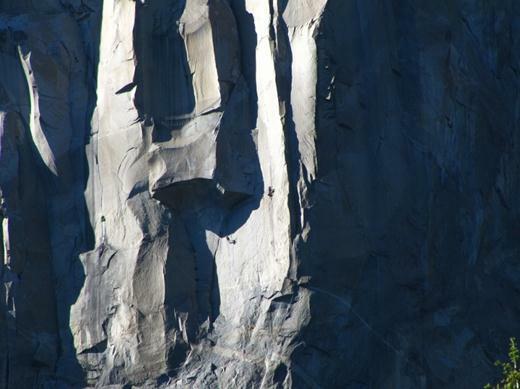 This shows the top edge of El Capitan. Do you see that piece jutting out towards the middle? Here’s a close up of the location. 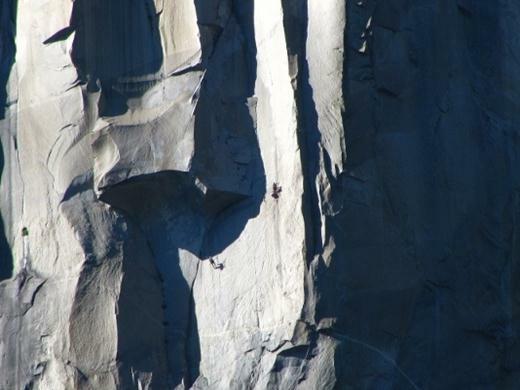 Well if you zoom in there are two climbers! This place is a climber’s dream. While we were there we saw at least 6 climbers on El Capitan. It can take them up to five days to climb up the rock face. At night their lights look like stars against the granite face. There is also an abundance of nature to see too. Check this little guy out. This brown bear cub was wandering around the river area in the valley just a minute off the main road. When the cub noticed us it started to investigate – walking straight for Jason! Just when we started worrying about where the bigger, angrier mother bear could be the cub had second thoughts about messing with the macho Mr. Robinson and wandered off into the woods. Next up, Yosemite part two. Most Amazing!! !….The dodgy trailer site and crazy gas prices were worthy, weren’t they!!! Yes indeed. 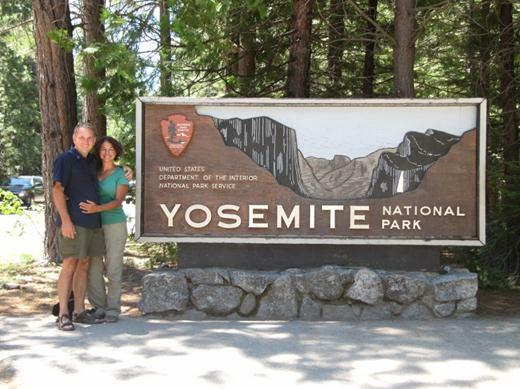 We just loved Yosemite! Have you been there?